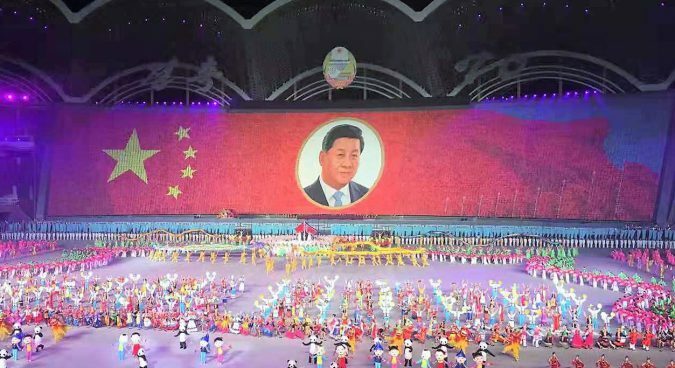 Chinese President Xi Jinping is rendered by thousands of children holding colored boards as a “human pixel” screen at the Glorious Country performance on Nov. 4, 2018, which concluded the Mass Games held in Pyongyang. Photo: NK News. The Democratic People’s Republic of Korea (North Korea) concluded its two-month long Mass Games on Sunday, Nov. 4, 2018. This year’s iteration of the national event concluded with a highly choreographed gymnastics bonanza celebrating the 70th anniversary of the founding of the regime — including over 100,000 North Korean gymnasts, singers, and actors who performed choreographies based on the regime’s history — and prominently featured Chinese President Xi Jinping in the same place of honor granted to former North Korean leaders Kim Il-sung and Kim Jong-un. Owing to the diplomatic isolation of the North Korean regime, North Korea’s Mass Games have been the regime’s way of sending messages to the wider world and serve as one crucial way to assess the possible future intentions of Pyongyang with regards to the various issues that have plagued regional diplomacy and geopolitics. Previous editions of the Games, such as “Arirang” — held annually between 2002 and 2013 —, featured an “official national narrative bundled into a 90-minute spectacle” while stressing themes of military advancement and superiority, anti-imperialism and anti-Americanism, and the glory of a regime founded in the wake of Japanese colonial rule and the destruction caused by the the Korean War. However, under incumbent North Korean leader Kim Jong-un, Mass Games were not held after 2013. In late June of this year, rumors that Pyongyang was hosting a new iteration of its Mass Games after a five-year hiatus were confirmed to be true, with a military parade in Kim Il-sung Square in Pyongyang marking the 70th anniversary of the founding of the regime and opening the Games on Sept. 9, 2018 after a five-year hiatus. Additionally, this year’s Mass Games reflected the changing diplomatic situation on the Korean Peninsula. Pyongyang extended invitations to not only longtime ally Beijing, but also Seoul — its rival Korean government to the south —, to send officials to attend the Games. South Korea’s Blue House confirmed on Sept. 19 that President Moon Jae-in would attend the Games during a state visit to the north, which ultimately resulted in President Moon delivering a live speech to cheering North Korean crowds at the Games — and broadcast to South Korea — on Sept. 20. 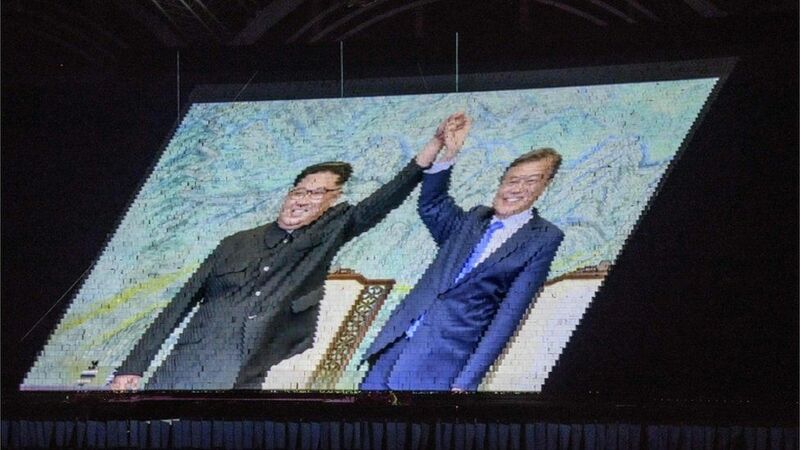 An image of North Korean leader Kim Jong-un (left) and his South Korean counterpart Moon Jae-in at a prior summit was also rendered by a “human pixel” screen at the Games. Photo: AFP. Beijing has been one of the few partners that Pyongyang consistently works with, whether it be the military aid rendered during the Korean War or continued economic ties amid international sanctions on Pyongyang. China has supported North Korea through the regime’s economic hardships, mainly through the tourism industry, continued coal imports (and payment with foreign currency, something Pyongyang is perennially short on), and infrastructure projects. While China joined the international community’s economic sanctions regime to put pressure on the regime to halt development of nuclear warheads and intercontinental ballistic missiles last year, by September China resumed receiving coal shipments from North Korea and revived its construction projects, such as the joint project to build a bridge between North Korean town of Namyang and Chinese town of Tumen. While there are signs that talks between US and NK have faltered since the US-North Korea summit in Singapore this summer, Pyongyang and Beijing continue to hold informal and formal dialogues. Ahead of the Mass Games that started this September, Chinese Politburo member Li Zhanshu was sent to Pyongyang to lay the groundwork for further diplomatic coordination between Xi and Kim and represent Beijing at the opening of the Games. Chinese foreign affairs vice-minister Kong Xuanyou (left), Russian deputy foreign minister Igor Morgulov (center), and North Korean foreign affairs vice-minister Choe Son-hui (right) meet in Moscow on Oct. 10, 2018. Credit: South China Morning Post. The cancellation of talks, scheduled for Nov. 8, between foreign ministers of the US and North Korea to lay the groundwork for another summit between the leaders of both countries suggests that Washington and Pyongyang have been able to reach a consensus on the specifics of the denuclearization of the Korean Peninsula. China will once again play the role of a crucial partner to any US strategy in dealing with North Korea, with top US diplomatic and military officials slated to hold talks with their Chinese counterparts on Nov. 9.